'Dance Bunny Dance' book along with Tutu Luly is a fantastic set to give as a gift to any infant, child or anyone young at heart. "Bunny twists, Bunny twirls, Bunny's dizzy in a whirl." Dance Bunny Dance is all about a little rabbit with big dreams of becoming a ballerina. This charming story is illustrated in soft pastel tones and will be requested again and again by your own aspiring little dancer! 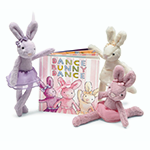 This Jellycat Books & Friends set includes all 3 Tutu Lulu Ballet Bunnies.